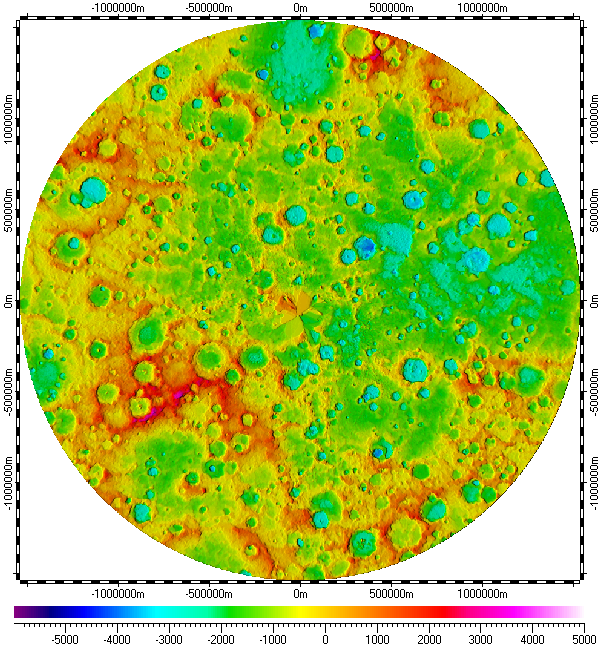 The datum of Digital Elevation Model of South Pole of Mercury, included in the archive, derived from refactored data of Mercury Double Imaging System (MDIS) DEM, version 1 of MESSENGER mission, which was prepared by USGS, and distributed by Planetary Data System (PDS) of NASA. The refactoring was based on images from Narrow Angle Camera (NAC) and Wide Angle Camera (WAC) of the MDIS. Base resolution of the datum is about 665m, but accuracy is much less than for 500m-resolution DEM of other Pole from Mercury Laser Altimeter (MLA) instrument, due principal physical constrains of the refactoring. The data uses Polar Stereographic Projection with true scale latitude of -90°. Also the datum contents sparse set of spatial regions covering main features of South Pole of Mercury. MercurySouthPoleDISDEM.zip - Size: 20,337,489 bytes (19.3 MB); MD5: DAABC848EAC72A577CC2557DDDB301C3.